"This painting is of a photograph I took of the inside of a freezer that was outside the gallery of an art show I was in. Curiosity pulled me to open the freezer and find a freezer full of frozen animal legs, and it made me think of preservation and of myself. 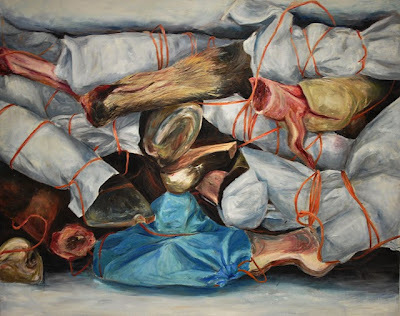 The image startled me into remembering that humans have instincts like animals despite the social structures we place ourselves in, and something from within insisted I make it into a painting." "This was done with a life model while I was studying in England. Flipping through magazines, I thought about how plain life can be unless you make the active choice to do something with it, and thus I used collage from the magazine that I felt were relevant to those thoughts. The skeleton and the body are to show the physicality of humans without their minds, as though someone is simply existing rather than living and experiencing: humans as items existing rather than lives living." "This is a wallpaper I made with a traditional damask pattern. I changed the insides of the pattern to faces of six of the young men who killed themselves during September in the United States as a result of senseless, homophobic bullying. 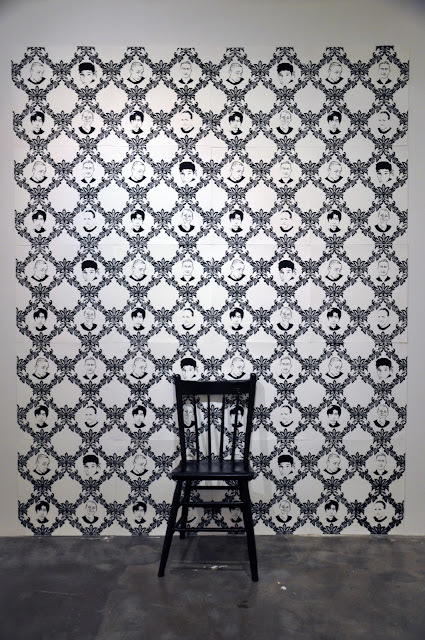 The chair is multipurpose: the idea is that a person could sit in the chair, and once sitting, is facing away from the wallpaper (away from the young men who's victimization was ignored). It could also put someone in the empty spaces in the wallpaper, as in they too are victimized. When the chair is empty, however, it can speak to the loss we have experienced of these young men due to senseless bullying." Chelsea Lawrick is an emerging artist from Vancouver, B.C. She employs the use of print making, drawing and painting to create works that express different sides of the human mind as well as raising social issues. 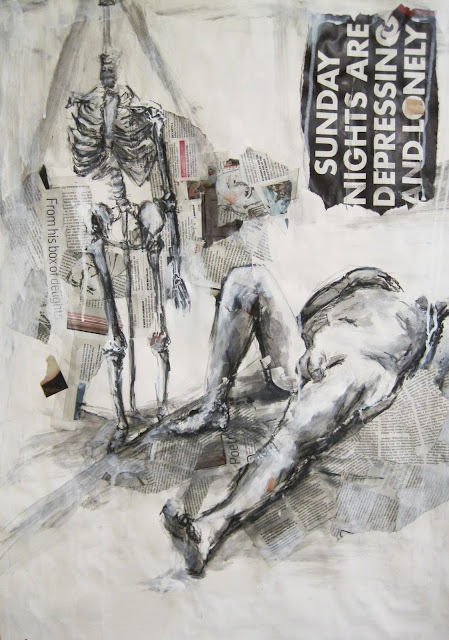 She draws on personal experience to create relatively dark representations of the human mind and social situations. Social issues are addressed through notions of memory and ignorance. She recently returned home from a four month long trip to England, where she took visual arts courses at the University of Central Lancashire and traveled to several European cities during her time off.